The defiant tone of Mnuchin’s letter was foreshadowed on Tuesday when he appeared before the House Committee. Cohen testified that Trump has lied repeatedly about his wealth, which could mean real trouble for the president. As House Democrats ponder offering Trump his entire $5.7 billion for a “smart wall,” progressives suggest $0 instead. 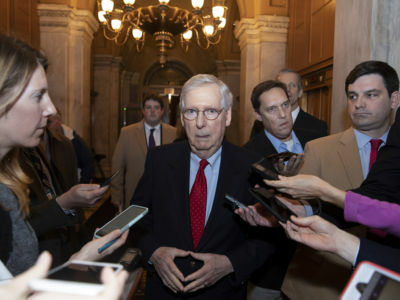 Protests targeting McConnell are raising questions about how long the Republican leader can continue to support Trump. Donald Trump is dragging the Republican Party down in the 2018 midterm elections. As the midterms loom, Trump is more unpopular than ever, and Americans are rallying behind Robert Mueller.